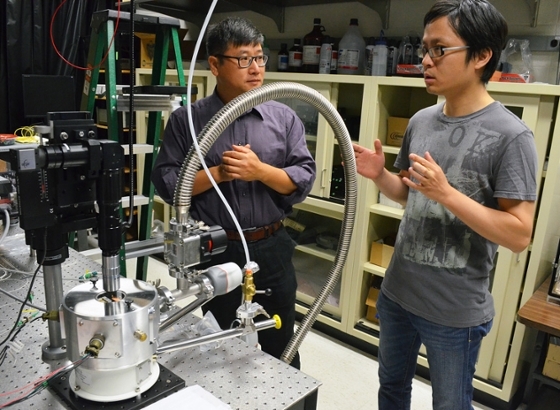 Qiang Lin, at left, assistant professor of electrical and computer engineering, and PhD student Wei Jiang, worked with researchers at the University of Victoria to show how the "optical spring" effect could enhance the detection of single particles and molecules. Two years ago, the Department of Physics and Astronomy honored the late Leonard Mandel, University physicist and pioneer of quantum optics, by establishing an award to recognize exceptional achievement by a junior faculty member. This summer, Qiang Lin, the inaugural recipient, has added to his record of achievement. "People have been working in quantum optics for four or five decades now," Lin noted. "Our own Leonard Mandel was one of founders of the field. A lot of the fundamental principles have been explored; now is the time to transfer fundamental science to practical applications." Lin received his Ph.D. in 2006 from the Institute of Optics, where he worked as a graduate student in the laboratory of Govind Agrawal, the James C. Wyant Professor of Optics and professor of physics. "He published 30 research papers before graduating, a record that is unlikely to be broken," Agrawal said when Lin received the Mandel award. Following his doctoral work, Lin was a postdoctoral scholar in the laboratory of Oskar Painter at the California Institute of Technology. He returned to Rochester in 2011. In 2014, he received a prestigious Faculty Early Career Development award from the National Science Foundation.